This entry was posted on December 24, 2016 at 8:20 pm and is filed under History of Science, Science, Systems Of Thought, Truth. You can follow any responses to this entry through the RSS 2.0 feed. You can leave a response, or trackback from your own site. Gee, you are taking flight here and leaving a whiff of awe behind. So science and truths are more like processes? The truth is on the way, as a way? When I read this the first time I struggled to understand it properly. Uncertainty over the meaning of words like “metatruth” was partly why. Yet in a sense the idea that truth evolves is a very obvious feature. Can’t recall who said: “Truth is in the eyes of the beholder.” but it is the case that seeing clearly is a rare skill outside the scientific community. What is very clear to me as we head for 2017 is that we are in an era where falsehoods, especially from our political leaders, will be the death of civilization. Happy Holidays to you and all your readers. Thanks for trying hard, Paul! The concept of “META” is not easy. Any logic L comes with META logics, which it generates. This is actually a direct consequence of the Godel Incompleteness theorems. That, if someone wants a formal proof. Informally, given a logical system L, it does not come all by itself. L is actually a triplet of L, U and T. L is the logic, U the Universe in which it lives, and T the notion of truth. Now, L itself has a small notion of truth, call it t, which has to do with “well formed propositions”. But that’s not enough. The notion of “Truth” is still something else.It turns out that there are self-contradictory proposals (Cretan/Liar paradox) which imply all and any logic is not complete. Happy Solstice to all, indeed! I wrote two novels set in the Roman times where the hero had to prove the heliocentric theory, i.e. you have to do it without reference to telescopes. I believe it can be done, and i demonstrated my argument. It cannot be done in the Mediterranean, though, because it depends on tides. Galileo was on the right track there, but he didn’t quite manage it, largely because due to his location the observable information was just outright confusing. Of course this cannot be done without falsifying Aristotle. As ana aside, Aristotle “falsified” the heliocentric theory – he pointed out that since orbital motion involves falling, and because heavy things fall faster than light things, the Earth would fall to bits if it moved. Oops! He also had an argument about there would be fierce winds due to the speed of orbital motion – because he argued the space was full of air. It might have been better had he checked his assertions. Apparently there were observations of the phases of Venus by naked eye, from way back to Mesopotamia (one needs a perfect atmosphere, of course, and a superior observer!!!) Full on Venus face disproves Ptolemaic theory… Galileo could certainly see the phases with the telescope (eye resolution is a minute of arc, Venus, 2/3 of that…). As far as the tide, Galileo had the WRONG (!) explanation. He had a fight about the explanation with his friend the Pope. After that, they were not friends anymore…. Kepler had determined that Mars was following an ellipse with the sun as focus. The argument made against Galileo was about the size of stars. A quirk in optics in primitive telescopes showed an apparent size to their disks. If they were as far as the heliocentric theory claimed (from lack of parallax), then they had to be immensely gigantic relative to the sun. 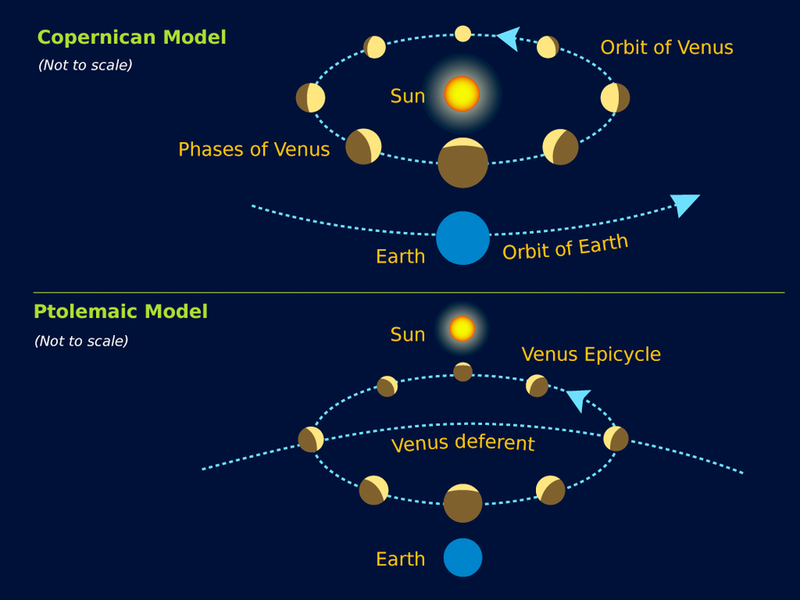 So some argued Venus turned around the Sun, the latter turning around Earth. I think much more refined, at higher resolution, study of Venusian phases showed that Heliocentrism was right. But that happened later. Buridan, with his Earth turning around the Sun, thanks to inertia, in a perpetual fall, probably believed in heliocentrism more than “Scripture”. It took 350 years before being sure, but many smart people were sure before that. How come? The Heliocentric theory was simpler. Axiomatically speaking. It was an economy of thought, and thus a greater plausibility.